Hy-Wire Car is without mechanical and hydraulic linkage end engine. Instead of these it contain a fuel cell stack and a drive by wire system. 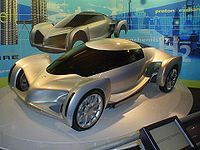 It is fully automated car it is a future car. In future it will have a wide application. The problem with fuel consumption and pollution can be minimize to certain level. Cars are immensely complicated machines, but when you get down to it, they do an incredibly simple job. Most of the complex stuff in a car is dedicated to turning wheels, which grip the road to pull the car body and passengers along. The steering system tilts the wheels side to side to turn the car, and brake and acceleration systems control the speed of the wheels. Given that the overall function of a car is so basic (it just needs to provide rotary motion to wheels), it seems a little strange that almost all cars have the same collection of complex devices crammed under the hood and the same general mass of mechanical and hydraulic linkages running throughout. Why do cars necessarily need a steering column, brake and acceleration pedals, a combustion engine, a catalytic converter and the rest of it? According to many leading automotive engineers, they don’t; and more to the point, in the near future, they won’t. Most likely, a lot of us will be driving radically different cars within 20 years. And the difference won’t just be under the hood — owning and driving cars will change significantly, too.